Actor Mads Mikkelsen won the Best Actor Award during the Cannes Film Festival for his role as Lucas. Every now and again a movie comes along, that will shake you to the core; a movie that will make you think about it for days – a movie that will leave a lasting impression. This is that type of movie. Now, as you should know, I’m from Denmark – but I don’t usually recommend Danish films to my readers. Today I’m making an exception. And that’s largely due to Mads Mikkelsen. Mikkelsen stars as Lucas, a popular Kindergarten ‘teacher’ who gets ripped out of his regular life when his friend’s daughter, Klara, tells a lie about Lucas… And I should probably leave it at that – I don’t want to spoil the movie completely for you. However, this movie shows us how ignorant we, as a society, are – and teaches us a thing or two about mass-hysteria. Mads Mikkelsen is amazing as Lucas, and the aforementioned award tells you more about his performance than I ever could. Moving on, there are a couple of other actors I’d like to mention. First and foremost, I love the somewhat simple acting by Annika Wedderkopp, who plays Klara – you could say that it’s all about how Vinterberg has directed her, but let’s give Annika the spotlight for now. Also, Thomas Bo Larsen, who plays Lucas’ friend, Theo. Granted, I’ve never been a fan of what Larsen’s done in his career – but in this role I found him convincing, even though I had feared the worst. This is a tragic story, but really it needs to be told. 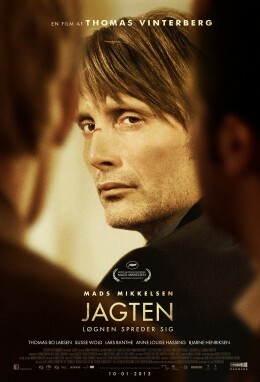 And I must say, this is the best Danish movie I’ve ever seen – and I’ve seen a lot. I found The Hunt, aka Jagten, to be very scary – and very sad. And this drama truly has stayed in my mind eversince I first saw it. I’m willing to bet you’ll feel the same way. This is a movie I really don’t want to spoil too much, so I won’t go into details – but… Just watch this movie. I would argue that this is Mads Mikkelsen’s best performance ever, he sells his part brilliantly and comes across really well. While not as chilling as he is in Hannibal or Casino Royale, or as cool as he is as “Allan Fischer” in Unit 1, aka Rejseholdet, this is by far my favorite performance and role for Mads Mikkelsen. Outstanding performance. Though you will find yourself smiling at some point, while watching this movie, you’ll most likely forget those scenes – and leave the movie with a lot of different emotions, such as anger and sadness. This movie is truly amazing, but be warned, not everyone will like to watch this movie – due to it being very harsh. You’ll know what I mean when you watch it. Final Grade: 10 out of 10. Outstanding performances. Best Danish Movie Ever? I think so.